Short post about the release of AirPrint Activator (APA) v2.0b13. 1st official release with PPC support. I fired up an old version of xCode and compiled a Universal binary based on a 10.5 SDK. Hopefully this should make APA available for PPC machine running 10.5. 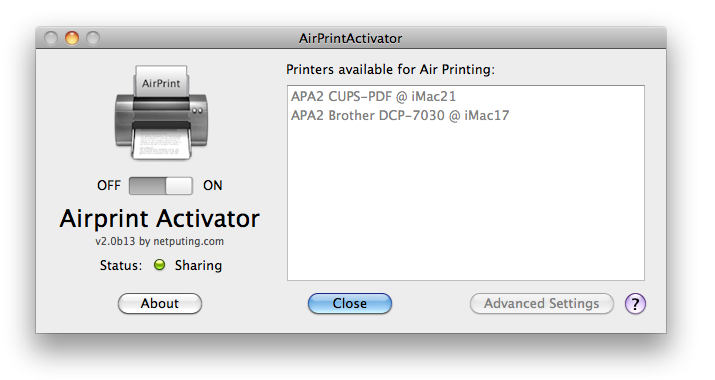 Have activated APA v2.0b13 on my IMac, and have attempted to add printer to list, but nothing shows up in window. Printer I am attempting to add is Canon MP620 which is on the supported list,and I verified that printer sharing is turned on in the sys pref / printer menu. I am using OSX 10.6.7, and the printer is connected to my Time Capsule with usb cable. I have read all the posts and I am unable to see any printers from my iPhone. During the “searc for printer” it finds nothing. The AirPrint Activator properly shares the networ printers. Are there any additional settings, (i.e. firewall, sharing, security, etc) that needs to take place? Downloaded and unzipped. Worked perfect in under 1 min. Wow. Love it. Thanks – you This saved me a bundle in not having to buy a new printer. My pleasure. I tend to ear more about people with issues than from people that successfully use the application. Just sits at Contacting Printer. Any help with this? Are you finning with firewall turned on? Is the printer USB attached on shared on the network? hi all, we have two printers (the dell shown in the attachment and a Canon i-Sensys MF8350Cdn) shared but only one is shown. how can we fix that? thank you very much in advance and regards from switzerland. So only one show up in the list? Are both shared by your Mac? Are they both attached? Thank you of this, I will be donating shortly! But here’s my problem. iMac running Lion, iPad running latest iOS version 4.3.5. I turn on Activator and immediately see the two printers I have connected to my mac (one by USB the other ethernet on the local network) I then also immediately see them appear in the iPad (using Pages) Share>Print>Select Printer. but when I hit print, nothing happens, and the docs don’t appear on the print queue on the mac . Any thoughts please? Canon printer shows up in AirPrint Activator window after I set it up as the video shows. Printer is not offline because I can still test print from the iMac. Where can I find this PPC-Version for download ? Thank you for compiling a PPC release! This is very useful for me since my PPC is the only one that I keep running 24/7. I’ve made a small donation in appreciation for your efforts. If it’s ever convenient for you to compile another universal version at some point, I know I’d appreciate it.